Bluefin Robotics sent a version of their submarine to help locate the missing Malaysian Airlines Flight 370. A Massachusetts-built robotic submarine has begun cruising thousands of feet beneath the Indian Ocean in search of missing Malaysia Airlines Flight 370. 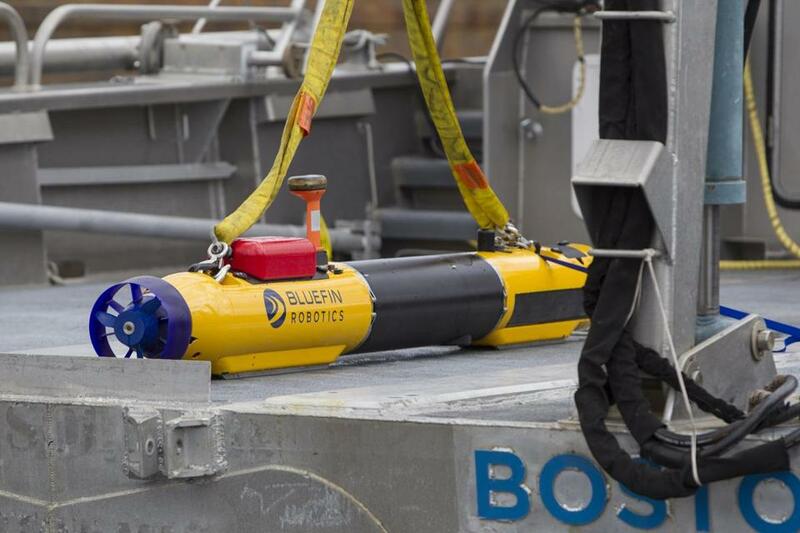 The Bluefin-21 robot, made by Bluefin Robotics Inc. of Quincy, is using sonar to scour the ocean floor for the Boeing 777 aircraft, which went missing on March 7. The robot was deployed to Australia three weeks ago by the undersea salvage company Phoenix International Holdings Inc. But because of the battery-powered robot’s slow speed and limited range, it could not be put to work until rescue workers had narrowed down the search area. Earlier this month Chinese and Australian ships detected sonar pings like those broadcast by a downed aircraft’s data recorder in an area about 1,400 miles northwest of the Australian city of Perth. More pings were detected three days later, but no more have been heard, and the recorders’ batteries, designed to last about 30 days, are probably dead. During a press briefing Monday, Angus Houston, the Australian official in charge of the search, said the time had come to launch the robots. Read: 3/25: Can Mass. ocean robots help find missing Malaysian jet? The Bluefin-21 can dive to 15,000 feet and cruise up to 3.5 miles per hour. The robotic sub carries side-scanning sonars on either side of its hull. The sub sails back and forth above the seafloor in a “lawnmower” pattern sending out sonar signals and recording the echoes. By analyzing the echoes, computers can draw a three-dimensional image of the ocean floor that may reveal the presence of sunken wreckage. However, with ocean depths in the search area at roughly 12,000 to 13,000 feet, Bluefin-21 will be getting close to its diving limit. “They’re right at the hairy edge of where they can operate,” David Gallo, director of special projects at the Woods Hole Oceanographic Institution, which has offered searchers the use of its own robot, Remus, in the search. Gallo said that some seafloor depressions in the area go as deep as 6,000 meters, or about 20,000 feet. The Remus 6000 was built for that kind of depth, but not the Bluefin-21. Bluefin Robotics is a subsidiary of the Battelle Memorial Institute Inc., a non-profit research and development corporation based in Columbus, Ohio. The company makes a variety of self-guided underwater robots used for scientific research, oil and gas exploration and military applications, such as minesweeping and seaborne reconnaissance. Houston said it takes the submarine two hours to dive to the correct depth and 16 hours to survey the area. Downloading and analyzing the recorded data takes another four hours. If it picks up likely targets, the Bluefin-21 can return to that location and shoot pictures with a high-resolution digital camera. The robot’s first day reconnaissance will cover about 15 square miles — a fraction of the 18,000 square miles now being searched by surface ships and aircraft. On the other hand, the Bluefin-21 can work around the clock, because day and night don’t matter in the deep ocean. “Weather permitting, you can go 24 hours a day,” said David Kelly, Bluefin’s chief executive. Phoenix International has only one Bluefin-21 at its disposal, and the Bluefin doesn’t have others it can send. “There’s not a huge inventory of vehicles sitting idle that can be mobilized and brought to bear,” Kelly said. In 2011, a trio of WHOI’s Remus 6000 submarines were used to find the wreckage of Air France Flight 447, which crashed in the Atlantic Ocean in 2009. Gallo said that his organization has not, so far, been asked to join the search. But he added that if searchers are very close to the location of the data recorders, one submarine may be enough. “I think that they’re so confident in the spot that they’ve got everything that they need,” Gallo said.